So as you can probably guess, over the past few days, I have received a lot of messages. They have come via email and via social media. They have been overwhelming, mostly because I was not prepared for them. My focus has been on the end of the school year (and my brilliant students) and I was not thinking that someone would copy and paste my writing and my photo on their Facebook page without a link to the source (until prompted-more on that later). That action made the post go viral for a second time and reopened the flood gates. When something goes viral, especially something around race, what you don’t see if you are not the poster is the vile garbage that gets directed at you from people on the internet. It must be said that the vast majority of responses to I Fit the Description have been kind and compassionate. The ones that come from the throat of hell/crazy/hate filled parts of the internet are difficult to bear. People say “Just ignore it!” but the messages are in your email in your phone in your home. The immediacy of these things is powerful-especially for people like me who have lived with PTSD for the majority of their lives. So I ignore most of those posts. And I ignore the ones that are wallowing in white guilt, requiring absolution, bragging about black friends/lovers/coworkers, or demanding that I see that “not all white people” are bad. I ignore the ones that demand I do some emotional labor to make the messenger feel better about what has happened to me. I got one though that stopped me cold. Thanks for your message. I wrote “I Fit The Description...” three years ago in order to process one of the worst days of my life. While seeing it go viral again after someone posted it on Facebook has reawakened that awful experience, I’m humbled that the post resonated with you. Short and to the point. I wanted to acknowledge that people had reached out to me, correct the record, and let people know what they could do for me if they were interested in conveying more than empathy. So as I was going through and responding to messages, I saw one where a writer from Texas had actually taken time to look at my work. I was thrilled to read it. Hi! I came across "the Post" today and in doing so happened upon your art, which has now consumed most of my morning work schedule 😀. Deeply personal and moving art. Thank you for sharing and am grateful to have found it. I've been mulling over colors for my daughters bedroom (which currently has wallpaper with rows and rows of one recurring mallard) and I believe I've found what I've been looking for in Three Deliberate Grays for Freddie. Any advise for finding the right color match if i were to go to Sherman Williams? The work the writer is referencing is Three Deliberate Grays for Freddie (A Memorial for Freddie Gray) a work I made for the Gardner Museum. It is a monochrome portrait of three moments in the life of Freddie Gray, a man who was killed by the Baltimore police department. The colors correspond to different moments in his life. The writer saw this work on my website (it’s the first image on my website-complete with title and location). Later they sent a third message. I think they read a little bit more about me and my work and realized what they said. I am trying to ignore it. I can’t stop thinking about the “rows and rows of one recurring mallard” juxtaposed with a color that is a representation of the murder of a black man. It brought me to the realm of the wallpaper created by Robert Gober, Hanging Man/Sleeping Man and artwork that marries white comfort with white violence against black people and realizes it in wallpaper-the object to creates domestic space. On the one hand, I can understand looking at the work and wanting to have the colors. In fact that is one of the reasons I made it. Part of the goal of the artist is to seduce, to make you come closer and investigate. Beauty is the lure that leads you to content. I wanted to make a beautiful facade for the Gardner Museum that would bring people in to talk about the extermination of a Black man by the state. In other work, I have explored the relationship between domesticity and violence. It is my understanding that America’s relationship to Black people is violence and it has always been violence in support of a domestic Identity. Violence against Black people is always framed as necessary to protect White women-the jewel of the domestic sphere. The person who sent the message was looking for a Sherwin-Williams color. I am a proud Benjamin Moore man myself. 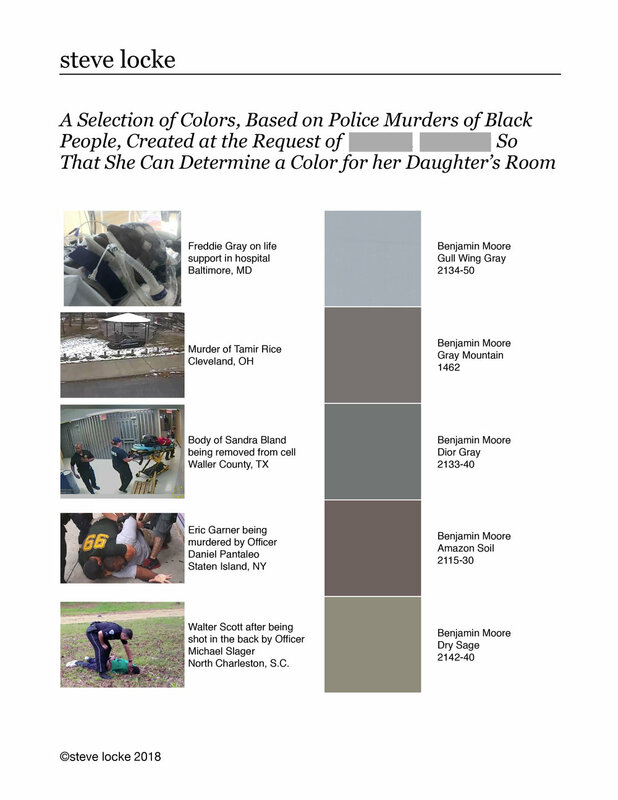 So using the same strategies that I used to develop the colors for Three Deliberate Grays I developed a palette of colors for the room of the messenger’s daughter, based on the murders of black people by law enforcement. Because I don’t have ventilation in my space right now (to be fair, I am trying to raise money to build a studio) I could not mix actual paint. I did, however come up with colors based on the Benjamin Moore color system. I picture the writer talking with their daughter trying to decide which color, representative of white supremacist violence, would go best with the rows of mallards. I sent the image to the writer. I have not gotten a response. I have mad respect for your privacy. Thank you for subscribing. You won’t regret it.